A person or group. In this context a librarian or machine subject indexing annotatable things. A thing which can be annotated with a concept or free text tag. e.g. a debate or petition or answer. 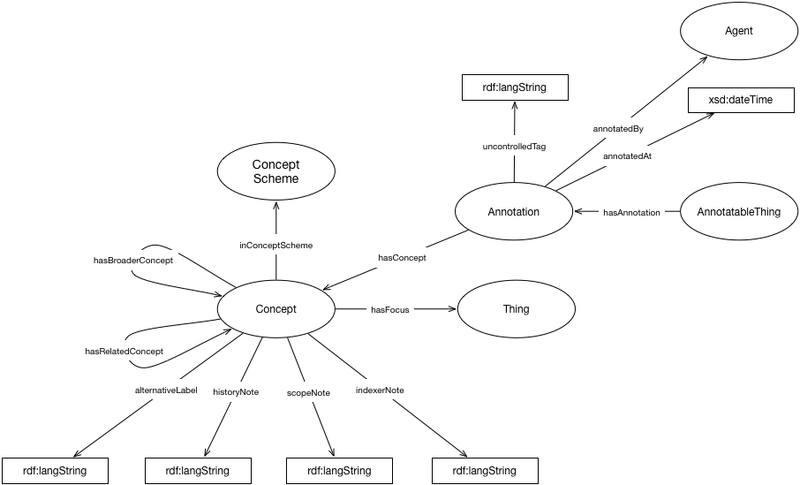 A relationship between an annotatable thing and a concept or free-text tag. e.g. an act of subject indexing. A concept. Similar to a SKOS concept / a library subject term. A concept scheme. Provides an arbitrary way to group concepts e.g. Commons Library to Lords Library. A thing. Anything at all. Relates an annotation to a agent. Relates an annotatable thing to an annotation. Relates a concept to a broader concept. Relates an annotation to a concept. Relates a concept to a real world thing that is its focus e.g. The concept / library subject term Winston Churchill to the person Winston Churchill. Relates a concept to another concept. Relates a concept to a concept scheme. Date time an annotation was created. A history note. Textual description of editorial changes to a concept over time. A note for indexers. Provides additional guidance on use of the concept. A scope note. Textual description of the intended usage of a concept. To allow for annotations that reference free text tags rather than controlled concepts.